I recently received my annual web hosting invoice for this site. This, together with domain name registration, costs me around £100 per annum. And, by the way, if you’re looking for a reliable independent web hosting service with excellent technical support, full features and non-USA hosting, I can safely recommend Meirhosting. The reminder that all this costs money as well as time gives me cause to reflect on why I’m doing it. My data on Google Analytics makes quite depressing reading: I get very low traffic, my most popular posts are the few dedicated to gear, and the least popular are those talking about photography and photographers in general. 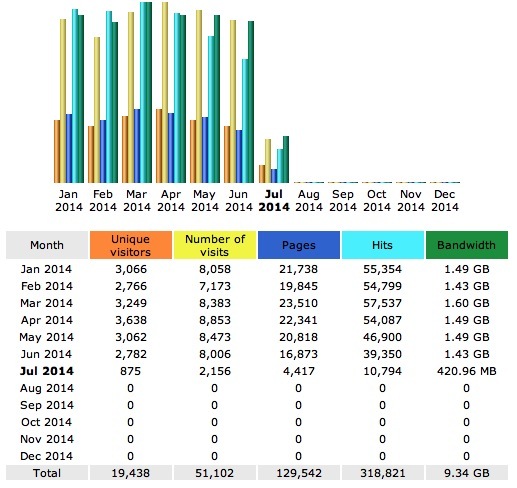 Earlier this year, the stats were trending upwards. Now they’ve slumped. AWStats shows a similar story - the levels are pretty flat. I’ve maintained a website since around 1996. I registered the snowhenge domain in 2001, I think, and the earliest version of snowhenge.net went live in or before August 2001, according to the Wayback machine. I added blogging through MovableType in mid 2003. My first post was made at 04:32 PM on 17th July 2003. Apart from a pause of a few months in 2007 when I transitioned to Expression Engine, and switched hosting, I’ve been adding material fairly constantly. So far there are 673 blog posts. There have been several design overhauls and refreshes, but the current look has been around for 4 or 5 years. The photographic content has changed over time, as I tried to improve presentation and focus, and the non-photographic stuff has dwindled to very little. The one constant in all of this, though, has been the flatlining statistics. My original motives for having a web site included a large part of experimentation with web technologies, which fed into my various “day jobs”. This is now gone, my day job has no need for such frippery. So it is now essentially a platform for publishing and talking about photography, and the arcana surrounding photography. The question is, then, is it working? At present the answer has to be no. There’s very little conversation, although what there is tends to be of above average quality, and statistics on my galleries show little interest from the outside world. So why so little traffic? A number of reasons spring to mind: the content is uninteresting, I’m not an engaging writer (or photographer), it’s all too self-serving, it’s all too idiosyncratic or weird, the presentation is poor. Or, also, I have no reach, I don’t publicise the site well, my search engine optimisation doesn’t work, I don’t network enough. Or the site performance is bad and the navigation is confusing. Or the Disqus comment platform is unpopular and puts people off. Probably a combination of all of these factors means that the site fails to get noticed in the vast ocean of similar voices clamouring for attention on the web. So what next? Should I just call it a day? It would be a shame, after close to 20 years of uninterrupted web presence, then again you could say after 20 years of failure I should have got the message. I could run a survey to see what my audience thinks, but there’s a bit of a snag in that plan. And then again, I’m not even sure I could keep up with things if I started getting a lot of feedback. It’s clear that one criticism could be that the site is too generalist, that is has a split personality. This is true enough, but it’s not accidental. It reflects my personality: I’m not just interested in photography - far from it - and not even in one particular field of photography. Personally I find that photographer “portfolio” sites get boring pretty quickly, however good the photographer is. I like to understand some of what makes the artist tick, not just photographers, but writers, musicians too. And I’m interested in science, and in much else. So the somewhat “warts and all” approach is me basically trying to create the type of website that I’d enjoy visiting. Seems I’m in a minority! One reason I axxed my Facebook page is that I was feeling increasingly uncomfortable about the wide cross-section of “friends” I had: I felt that by posting stuff on say, Antarctic science, I was letting down people who followed me as a landscape photographer. 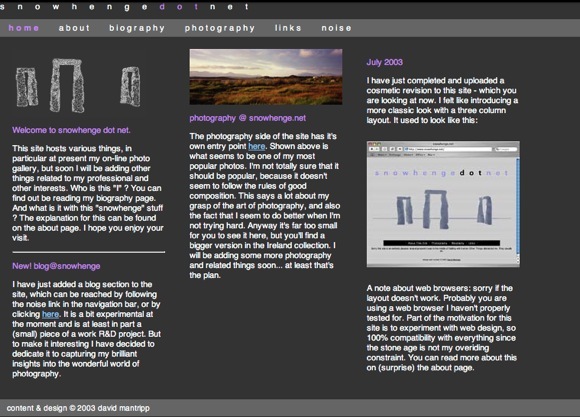 The ultimate goal of snowhenge.net is to promote my photography. That isn’t working, and the years are ticking by. My feeling at the moment is that I’ll give it another year, and seriously put some effort into improving traffic. I don’t hope for thousands of visitors - I’m happy if just one person gets some benefit from an article I post - but I don’t want to carry on shouting into the void. So in the coming weeks I need to settle on some realistic expectations and measurable objectives, and work out a plan for achieving them. If trends start to improve, fine. Otherwise, in one year it will be time to call it a day. This is the point where, ironically, I ask for feedback. It would be great to get any opinions, suggestions thoughts, advice on all of this, but also just to let me know that you’re reading my writings and getting some sort of value out of it. There are many blogs which I read frequently, but never comment on. Maybe it’s a similar story here. Hey, maybe the problem is that all my posts are too long ? Next entry: This season, I’ll be mainly wearing….